She was referencing my teaching series entitled Understanding the Heart of Prayer. The very first message discusses binding and loosing. In that message, it clearly teaches what binding and loosing means. (Matthew 16:17-19) You need to go to our site and listen to or download this series! People are bound by the lies of the devil, they are sick, defeated, lost, etc. When we preach and teach the gospel, the light of the gospel shines upon them, the ones whom Satan has blinded and bound (2 Cor. 4:4). It is through the preaching of the gospel and the demonstration of the kingdom of God because of Christ’s work on the cross, that the devil is exposed and bound from continuing to operate in a person’s life. That person is then loosed from his grasp and it always produces rest (Sabbath). The keys of the kingdom are simply the revelation that Jesus is the Christ and that He defeated Satan and has given us the authority to enforce Christ’s victory and Satan’s defeat. When we minister and administer the gospel, the devil is bound and people are free! It is the gospel that binds the devil! It is the gospel that looses the captive! That’s binding and loosing! It is the gospel that binds the devil! 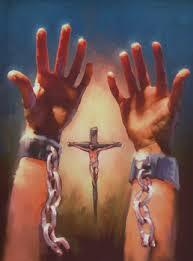 It is the gospel that looses the captive! Because of that revelation, we continue to preach to the nations, both abroad and right here in the USA. 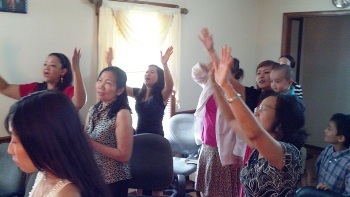 In September, I had the privilege of ministering in a Vietnamese house church in North Carolina. It was a blessing being able to preach while the message was being interpreted into Vietnamese. That is something that we were used to while living as missionaries overseas. What was exciting to me was that I was used to going to other nations to preach to people from a different culture. I was used to God sending me to where there was a need for the gospel. However, after the service, one Vietnamese lady told me her testimony that she heard the gospel and received Christ after moving to the USA. I realized that God has different ways of ensuring that people have the opportunity to hear the gospel. In some instances, He sends gospel ministers to a foreign land. In other instances, He has a way of bringing people from a foreign land to where the gospel can be found. In keeping with our responsibility to bind and loose, in the beginning of November, we will be going to India and ministering in the cities of Mumbai, Hyderabad and Chennai. We will be preaching and teaching the gospel in churches and bible schools. While in Chennai, we will take a bus to a place about three hours away to visit an orphanage called Inspired Living Children Home. Our U.S. contact in Chennai put us on to this orphanage as we wanted to help an orphanage in a tangible way. This children’s home must acquire more land and build a bigger facility in order to keep up to code. With your help, Kingdom Equippers has already sown $2000 so they can purchase one lot of land. This was a great opportunity for all of us to be a part in providing a place where children can be housed, fed, educated, taught the good news of Jesus, rescued and loosed from Satan’s grasp. We would also like to mention that the total cost for our trip to India is $4000. If you would like to help us financially to go and preach and teach the gospel in India, you would be sowing into good ground.